The notion that black and Latino students can’t compete with white and Asian students in school is gaining national momentum. Amazingly, this attitude isn’t coming from crazy right wing conservatives or Tea Party zombies (conservatives and Tea Party members actually lobby for a colorblind society where the divisive politics of race, such as affirmative action, are finally removed once and for all), but from civil rights groups and so called “social justice” advocates who claim to have the best interests of minorities in mind. The Florida Board of Education is currently holding minority students to lower standards by stating that 74 percent of blacks, 81 percent of Hispanics, 88 percent of whites and 90 percent of Asians should be reading at grade level by 2018. Last month, the NAACP Legal Defense and Educational Fund, along with a coalition of other educational and civil rights groups, filed a federal complaint attempting to lower the admission standards of eight elite New York City schools claiming the Specialized High School Admissions Test (SHSAT) is too difficult and discriminates against black and Latino students; the reading portion of SHSAT requires students to write in coherent paragraphs, use logical reasoning to answer questions, and analyze text; and the math portion requires knowledge of arithmetic, algebra, probability, statistics, geometry, and trigonometry. The notion that minority students “can’t,” promoted under the guise of social justice, has infiltrated 21st century public education in many ways. In addition to admissions tests being “discriminatory,” minorities can’t compete with whites and Asians because they are being unfairly diagnosed as emotionally disturbed (there is little documented evidence of actual misdiagnosis); are being unfairly disciplined and suspended (actual cases of racial discrimination by public school officials are practically non existent); are being “pushed-out” of schools (not a single school administrator has ever been prosecuted for forcing a child out); are faced with conscious or unconscious racial discrimination by school teachers (nary a documented case exists); lack money and funds (hundreds of billions of dollars have been pumped into schools in poor and disadvantaged communities since 1965 via Title 1 of the Elementary and Secondary Education Act); and of course, the trickle-down effects of slavery (which officially ended in America over 149 years ago, on January 1st, 1863). How much these issues are impacting the educations of minorities is debatable. But one thing is clear: these ideas are being repeatedly communicated to minority students (and their parents) as to why they can’t compete with their white and Asian peers; these issues also seek extrinsic solutions (which students have no personal control over) rather than focusing on the intrinsic values and behaviors they can control. In 2010, the Educational Testing Service (ETS), headquartered in Princeton, NJ, issued a policy information a report titled “The Black-White Achievement Gap: When Progress Stopped.” The report highlighted two periods in the fight to close the racial achievement gap in America: a period of progress from the Civil Rights Movement to the 1980s when the achievement gap between black and white students was cut in half; and a period of stagnation from the late 1980’s to the present when the achievement gap leveled off and in some cases, widened. The first period, the one marked by significant progress, was most likely the result of desegregating schools and upgrading conditions for minorities. Suffocating racial discrimination and the bogus notion of “separate but equal” was tackled and for the first time gave many minorities access to equal educational resources, such as books, clean schools, rigorous curriculum, qualified teachers, etc. For the most part, systematic inequalities were corrected, helping minorities gain valuable ground on their white peers; this progress continued steadily for several decades. But in the late 1980s, something happened. The achievement gap in America stopped closing. This perplexed many education advocates because it was around this time that the multicultural education and social justice movements started to bloom. The ETS report cites disappearing fathers, the decline of the nuclear family, concentrated deprivation, nutrition, and mobility issues as reasons for the stop in progress. But there is a larger trend that explains why the gap has stopped closing: social justice advocates and civil rights groups have been placing too big of an emphasis on systematic change and not enough emphasis on individual transformation. And why not? For nearly 30 years, fighting for changing the system worked wonders (as noted above). Tragically, however, it appears that this mode of operation is no longer garnishing the same kind of results. Advocating for societal change appears to have hit its peak in terms of educational achievement 25 years ago. That’s not to say it’s time to end the fight to bring equity to the system; the system still has room for improvement. All change is self-change. Until civil rights groups and social justice advocates embrace this reality, America’s racial achievement gap will remain frozen in time. Instead of working with minority students to improve skills, civil rights advocates want to lower the bar for everyone. A coalition of educational and civil rights groups filed a federal complaint on Thursday saying that black and Hispanic students were disproportionately excluded from New York City’s most selective high schools because of a single-test admittance policy they say is racially discriminatory. . . . The SHSAT is a timed multiple-choice test with two sections, verbal and math, that must be completed in a total of 2 hours and 30 minutes. In the first section, students demonstrate their verbal reasoning and reading comprehension by ordering sentences to form a coherent paragraph, answering questions of logical reasoning, and analyzing and interpreting texts. In the second section, students demonstrate their math skills by answering computational and word questions that require arithmetic, algebra, probability, statistics, geometry, and trigonometry . . . In other words, the SHSAT is discriminatory because the reading portion requires students to write in coherent paragraphs, use logical reasoning to answer questions, and analyze text. What bias! On the math portion, students must know arithmetic, algebra, probability, statistics, geometry, and trigonometry, or put another way, they must know how to do math. How racially insensitive! I agree with Hewitt, it is shameful. It’s shameful that all cultural groups, according to ETS’s report “Parsing the Achievement Gap II,” don’t place a high emphasis on educational achievement; it’s shameful that all cultures, according to ETS, don’t value reading; it’s a shame that all cultures don’t always respect authority; maintain a two-parent nuclear family; actively participate in homework and school; regulate internet and television watching; emphasize nutrition and exercise; and stay mentally active over holidays and summer months. [Asians] cited their parents’ observance of ancient belief systems like Confucianism, a set of moral principles that emphasizes scholarship and reverence for elders, as well as their rejection of child-rearing philosophies more common in the United States that emphasize confidence and general well-being. So how do people like NAACP lawyer Damon T. Hewitt, who claim to have the best interest of minorities in mind, respond to the situation at NYC’s eight elite high schools? Does he preach having young black and Latino children (and their parents) roll up their sleeves and get down and dirty with the business of making education a number one priority? Of learning arithmetic, algebra, probability, statistics, geometry, and trigonometry? Of answering questions using logic and writing in coherent paragraphs? Of eating right, and exercising right, and doing homework, and reading books, and staying mentally active over the summer and holidays? No, Hewitt does none of these things. He calls the SHSAT’s discriminatory and files a complaint with the US Department of Education. In Hewitt’s mind (and in the minds of social justice advocates who preach a toxic brand of educational socialism), equal opportunity isn’t good enough; they demand equal achievement. Performance–and more importantly, preparation–doesn’t matter. Racial balance is the ultimate goal, even if it’s achieved by infringing upon the rights of high achievers. Never mind the sacrifice of elite students who’ve paid their dues and earned their admittance through years of hard work. Forget hard work and results. Hard work, like being on time, is simply a matter of cultural perspective. Obsession with race and the misguided ideology of social justice is once again killing academic excellence in America’s public schools. By 2018 in Florida, 74 percent of black students, 81 percent of Hispanics, 88 percent of white students and 90 percent of Asians should be reading at grade level. In discussing IQ tests, for example, the black mean is commonly given as 85, the white mean as 100, and the standard deviation as 15. But the differences observed in any given study seldom conform exactly to one standard deviation. . . . A total of 156 studies are represented in the plot, and the mean B/W difference is 1.08 standard deviations, or about 16 IQ points. In a nutshell, Herrnstein and Murray used 70 years worth of cognitive tests to conclude that Asians have an average IQ of 105, that whites have an average IQ of 100, that Latinos have an average IQ of 90, and that blacks have an average IQ of 85; these findings led many to accuse Herrnstein and Murray of practicing scientific racism. It appears, at least at first glance, that the Florida Board of Education is embracing such racism by holding minority students to lower standards in reading than Asians and whites. Superintendents also say there is an element of uncertainty in the targets because the state will introduce a new national assessment in two years. “We have no idea how students will perform or how individual subgroups will differ in their performance,” said the Miami-Dade County schools superintendent, Alberto M. Carvalho, calling it “unthinkable” that the state would set these goals at this time. But Florida is not alone in setting interim goals by race and other categories. An analysis this week by Education Week found that of the 34 states with new accountability plans, only 8 set the same targets for all students. Lynette Gaymon’s letter takes no responsibility for her actions, and contains no apology to Samantha Pawlucy. As a fellow Philadelphia public school teacher, I am disappointed by Lynette Gaymon’s handling of the Samantha Pawlucy incident. Regardless of how events unfolded that day in her class (Gaymon is not denying the fundamental facts), what Gaymon labels a “light and humorous remark” is nothing of the sort. From her “apology letter” it seems clear that Gaymon still doesn’t understand that her comments were grossly inappropriate. My words were never meant to belittle Ms. Pawlucy, or cause any harm, and I truly regret that we have come to this point. I don’t think I’m being unfair to Gaymon. There is a fundamental lack of personal responsibility in her letter, and nowhere in the letter does Gaymon admit wrongdoing. In fact, it almost seems as if Gaymon still believes that “all the chaos and negative attention” that has fallen on the school is the result of some sort of misunderstanding. Again, Gaymon never comes out in the letter and says I’m sorry Samantha. I’m sorry for making fun of something that was important to you, for making a joke that spun out of control, for unintentionally humiliating and embarrassing you in front of your classmates and other teachers. I didn’t mean it Samantha, and I am sorry. Nor does Gaymon apologize for stereotyping an entire group of people in front her students: She never says, I’m sorry that I equated all Republicans with racists. I’m sorry that I used a hate symbol—the KKK—as a reference to Mitt Romney and Paul Ryan. This was unwarranted. Although we all may not agree with Republican policies, it’s hateful and intolerant to stereotype whole groups of people. To her credit, Gaymon does call for solving problems civilly through debate and discussion, and she does call for a stop to the threats and violence being perpetrated against Samantha Pawlucy. But Gaymon’s letter is hardly an apology to Samantha Pawlucy herself, and falls short of taking responsibility for the situation. Its vagueness and avoidance of the fundamental issues of stereotyping and intolerance are similar to the ways in which the local Philadelphia media dodged these same issues. Because of this, I truly wonder if Lynette Gaymon even knows that what she said was wrong, or if she just feels it was all a simple misunderstanding. If it’s the latter, Lynette Gaymon is unfit to be in the classroom. To read Gaymon’s letter in its entirety, click here. Update: Wally Zimolong, the attorney for the Pawlucy family, stated this morning on the Dom Giordano show that Lynette Gaymon was ready to give a personal apology to Samantha Pawlucy and accept wrong doing, but was given a prepared statement instead. Click here to listen to the interview. The Inquirer’s latest poll on the “Romney T-shirt” incident shows just how pathetic the response from the Philadelphia liberal establishment has been. Today the Inquirer asked it readers: “Should a teacher make fun of a child wearing a T-shirt supporting a political candidate?” The poll is so warped and mindboggling that I won’t even bother to list the four possible responses. Anyone in their right mind knows the answer to this ludicrous question, and the answer is no, a teacher shouldn’t make fun of a child. The fact that the Inquirer asked it reveals a lot about the newspaper, its readers, and the hypocritical culture of Philadelphia’s liberal establishment. The reason the Inquirer is posing the question, of course, is to downplay the seriousness of the Romney T-shirt incident. It’s a way to equate intolerance with “making fun” or “making jokes.” Should teachers be able to joke around with their students about political things? they are saying. What do you think? Is it really such a big deal? It’s clear the Inquirer’s editorial board isn’t convinced that what happened to little Sam Pawlucy is an absolute, unquestionable injustice. If what happened to Pawlucy were an unquestionable injustice (like, say, the unquestionable injustice of violating gay rights), the Inquirer wouldn’t still be grappling with public opinion on the issue. For example, you would never see an Inquirer poll asking the question: “Should a teacher make fun of a child for wearing a LGBT rainbow T-shirt?” They wouldn’t ask it because when it comes to such issues, there is zero tolerance. In other words, you don’t make fun gays, period. You don’t even joke about it. Especially, and most importantly, teachers. Likewise, the Inquirer would never run a poll asking: “Should a teacher make fun of a child for wearing a Muslim Taqiyah cap?” They would never run a poll asking: “Should a teacher make fun of a child for wearing a Travon Martin memorial shirt?” Again, these are issues apart of the liberal sacred untouchable cannon, so the Inquirer would never ask such questions. But when it comes to making fun of Republicans or comparing a Romney/Ryan T-shirt to the KKK, the Inky runs a poll. Should teachers be allowed to do it, what do you think? Interestingly, the local media—the Inquirer, Daily News, and their columnists and editorial boards—have yet to publically reprimand Samantha’s geometry teacher for the egregious transgression of stereotyping Republicans as the KKK (both papers have focused on the issue of freedom of speech, and only Christine Flowers had the guts to bring up bullying). No one has come out and righted this wrong by setting the record straight. No one has said, It was unconscionable of this teacher to compare a Romney Ryan T-shirt to the KKK. Most Republicans are not racially insensitive, and it was wrong for this teacher to stereotype this group in front of her students. Imagine if a teacher (jokingly) made a Muslim student take off his Taqiyah cap because she said (jokingly) that this cap represented terrorism. After the teacher was crucified, sued, chewed-up by the ACLU and spit out, and ultimately fired, there would be a series of editorials and commentaries chastising this teacher for being intolerant, and the record would be set straight immediately: It is wrong to stereotype Muslims as terrorists, because most are tolerant, peaceful people. Smear a Republican in a heavily Democratic town such as Philadelphia and you get ill-defined “teachable moments.” Equate a Republican T-shirt with the KKK and the remedy is a vague, feel good lesson on “political differences.” Sure, a teacher stereotyped an entire group of people with a symbol of hate, but can’t we all just get along? Can’t we just get back to our normal routines? She did say she was joking, after all. Suddenly, amazingly, the unbending hyper-vigilant politically correct left has a sense of humor! Actually, I don’t buy for a second that they have a sense of humor. The reality of the Romney T-shirt incident is that newspapers like the Inquirer and the Daily News don’t want to debunk the Republican = KKK stereotype because they benefit too greatly from it politically. In fact, newspapers like the Inquirer and the Daily News promote such stereotypes (Republican Voter ID = Jim Crow is just one example that comes to mind). So as it stands in Philadelphia, Republicans are indeed 21st century Klansmen, you just can’t say so out loud in class if you are a teacher and your student happens to be wearing a GOP T-shirt. Instead of speaking out against political intolerance, Karen Heller blows smoke. Before I analyze Heller’s commentary further, allow me to recount the bad joke. A week-and-a-half ago, Charles Carroll High School sophomore Samantha Pawlucy and her sister, who are White, wore Romney/Ryan T-shirts to school on dress-down day. Allegedly, Samantha’s younger sister was heckled by classmates for the shirt. Samantha herself was also allegedly heckled—by her African American geometry teacher whose inappropriate joking embarrassed and humiliated her. Samantha Pawlucy, a sophomore at Carroll, said her geometry teacher publicly humiliated her Friday by asking why she was wearing a Romney/Ryan T-shirt and going into the hallway to urge other teachers and students to mock her. . . .
Samantha Pawlucy said that after going into the hall, her teacher called into the classroom a nonteaching assistant who tried to write on the T-shirt with a marker. She allegedly told the teen to remove her shirt and said she would be given another. Pawlucy said her teacher told her that Carroll was a “Democratic school” and that wearing a Republican shirt was akin to the teacher, who is black, wearing a KKK shirt. The only silver lining is that the budget won’t be debated until spring. By that time, perhaps Republicans—the same ones who attempted to disenfranchise Philadelphia through voter ID—will have forgotten this mess. Richard Pawlucy tells me he has never voted before, which makes him an improbable participant in a political fight. A field engineer raised in Port Richmond, he registered only a few weeks ago. Heller’s article is indeed a teachable moment—about double standards and the hypocrisy of a liberal media with zero principles. For those who disagree, ask yourself this question: Would Heller have written the same feel good “teachable moment” article if a White teacher jokingly humiliated a Black student for wearing an Obama T-shirt and equated the shirt with, say, lazy Black welfare recipients? When it comes to tolerance, the Samantha Pawlucy incident reveals our city’s glaring double standard. George Orwell wrote Animal Farm nearly 70 years ago but the novel and its themes of hypocrisy, corruption, and double-standards are more alive than ever. Ironically, this week I will be starting a unit on Animal Farm with my students and over the course of the next month we will be analyzing Orwell’s text as an allegory for the atrocities of communism and the Russian Revolution. We will also be taking a look at how the novel’s themes apply today. A current event we will cover is the recent “Romney T-shirt” incident involving Charles Carroll High School student Samantha Pawlucy. 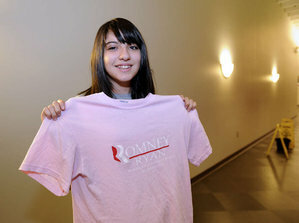 Last week Pawlucy, a white 10th grader, wore a pink Romney/Ryan T-shirt to school on dress-down day and was allegedly ridiculed by her African American geometry teacher and a school aid for being disloyal to the Democratic party; Pawlucy’s brother also wore a Romney T-shirt to school and was harassed by classmates. Samantha Pawlucy, a sophomore at Carroll, said her geometry teacher publicly humiliated her Friday by asking why she was wearing a Romney/Ryan T-shirt and going into the hallway to urge other teachers and students to mock her. “I was really embarrassed and shocked. I didn’t think she’d go in the hallway and scream to everyone,” Pawlucy said. “It wasn’t scary, but it felt weird.” . . .
Lynette Gaymon, Pawlucy’s teacher, apologized to Pawlucy and her family during a school meeting the following Monday, although the Pawlucy family has stated that they question the sincerity of Gaymon’s apology. Apparently, the black geometry teacher and the school aid were just joking when they made the alleged comments about Pawlucy’s Romney T-shirt. Yesterday, the Pawlucy’s went to Carroll High School to file an official complaint, where they were heckled by students who shouted obscenities at the family. For the past week students have been threatening Samantha, and the girl currently fears for her safety. The Philadelphia School District is currently investigating the situation, and Gaymon, who made no comment to the Inquirer, is still teaching at Carroll although no longer teaching Pawlucy’s class. One of Orwell’s central concerns, both in Animal Farm and in 1984, is the way in which language can be manipulated as an instrument of control. In Animal Farm, the pigs gradually twist and distort a rhetoric of socialist revolution to justify their behavior and to keep the other animals in the dark. The animals heartily embrace Major’s visionary ideal of socialism, but after Major dies, the pigs gradually twist the meaning of his words. As a result, the other animals seem unable to oppose the pigs without also opposing the ideals of the Rebellion. By the end of the novella, after Squealer’s repeated reconfigurations of the Seven Commandments in order to decriminalize the pigs’ treacheries, the main principle of the farm can be openly stated as “all animals are equal, but some animals are more equal than others.” This outrageous abuse of the word “equal” and of the ideal of equality in general typifies the pigs’ method, which becomes increasingly audacious as the novel progresses. This theme fits perfectly into the “Romney T-shirt” incident, as well as the collective effort by Philadelphia liberals to manipulate language in order to demonize and vilify all those who oppose Democratic policies as well as the Democratic party. When I say “Philadelphia liberals” I mean teachers, parents, the local media, and any other entity that works to indoctrinate youth and kill freedom of expression. In other words, teachers (Lynette Gaymon equating a Romney T-shirt with the KKK), local columnists (Annette John-Hall equating voter ID laws to the violence and opression of Jim Crow), and parents (mothers and fathers who teach their children that wearing a Romney T-shirt is racist) are abusing language in order to intimidate and bully others into following their politics and world view; they are using language not as a means of freedom but as an instrument of control. Just as the pigs twist and distort Major’s visionary ideal of socialism to keep the other animals in the dark, so are the media–and now, incredibly, schoolteachers–distorting Martin Luther King Jr.’s vision of equality and social justice to keep children and citizens as a whole misinformed about Romney and the Republican party. As a result, because of the manipulation of language, students like Samantha Pawlucy and her brother are no longer able to oppose the politics of the Democratic party without opposing the ideals of MLK and being labeled “racist” in the process. My wife and I live and work in Philadelphia, and we see this on a regular basis. In the high school where I teach, the anti-Romney, anti-Republican attitude is so deeply embedded in the culture it has permeated the drinking water. Just mentioning Mitt Romney’s name causes many of my students to cry “racist” and “bigot” and “hater,” and for what? Because he’s a Republican? Because he’s a Mormon? Because he believes in traditional families, a free market, and small government? Because he wants to cut entitlements, cut taxes, and believes that people should be the captain of their own ship? This makes him an intolerant racist devil? Last night, my wife and I went to the Olive Garden on City Line Avenue in Bala Cynwyd. Because of its approximation to Wynnefield, the restaurant is both staffed and frequented predominantly by African Americans. As we entered the restaurant, we immediately picked-up on the fact that we were receiving dirty looks from other patrons eating their dinner. 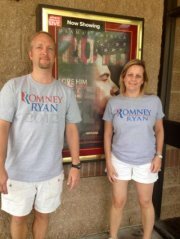 Interestingly, my wife happened to be wearing her Romney/Ryan T-shirt. This thinking and behavior, both verbal and nonverbal, is dangerous for a couple reasons. First, it is an assault on free speech and democratic ideals. Shutting down other’s opinions and calling them names (and using grossly inappropriate hyperbole such as “KKK” and “Jim Crow”) is the ultimate example of intolerance and hate speech. Second, it is divisive and shuts down the avenues of communication. Instead of teachers, parents, and the media promoting teamwork and teaching our youth to listen to the views of others and exploring alternative viewpoints, today’s youth are being taught to close their minds to opposing viewpoints and are being conditioned to call names. Put another way, our city is preaching hate and intolerance. Tragically, there seems to be very little public outrage. If the situation were reversed (if a black student were ridiculed by a white teacher for wearing an Obama T-shirt), there would literally be protests in the streets (think of the Valley Swim Club debacle or the Don Imus Rutgers joke). Al Sharpton or Jesse Jackson or both would be on a plane to Philly, and the local chapter of the NAACP would be circling the wagons. The Philadelphia School District would have issued a formal apology by now and you can bet the teacher in question would be at the very least on administrative leave. To show support for Samantha Pawlucy and freedom of speech in general, I will be wearing my Romney/Ryan T-shirt next week as I teach my lesson on Animal Farm. Because this is not an official message of the school or district, because I will not use this to indoctrinate my students, and because I do not feel it will cause a disruption in the classroom or school, I feel I am well within my rights to publicly show support for Samantha Pawlucy and for freedom of speech in general. It’s time to bring back America’s democratic ideals, and to speak out against the campaign of hate and intolerance being promoted by parents, misguided teachers, and the local media. Please visit the “Support Samantha Pawlucy” page on facebook to show your support. The results of Pennsylvania’s annual standardized tests came out recently, and it seemed everyone was pointing fingers. Math and reading scores are down an average of 1.5 points statewide – 8 points in Philadelphia. Teachers’ unions are blaming cuts in education funding for the slump, and they have a point. Last school year, Gov. Corbett cut $860 million in funding for K-12 education, or about $410 per student. This hit impoverished school districts the hardest; in Philadelphia, state education funding decreased by about $557 per student. “When resources are pulled from our schools, scores drop,” said Philadelphia Federation of Teachers president Jerry Jordan. This is an excerpt from my commentary in today’s Philadelphia Inquirer, “K-12 cuts and consequences.” Please click here to read the entire article. You can respond or provide feedback by clicking on the comment button below.